Prepared by Edgar A. Bracht. Published with the permission of The Toronto Cricket Skating and Curling Club. At the turn of the 18th century cricket was in its infancy as a sport in North America. Basketball and baseball had not evolved yet and lacrosse was a game played by native Canadians only. The regiments from England had brought cricket to North America playing at their garrisons, with the first recorded matches played in Ile St Helene (Montreal) and in Kingston, but civilians had not yet organized themselves to play the game. At this time horse racing was a popular sport with the people of the day. When George Anthony Barber and Thomas Phillips arrived from Britain in 1825 as a new master and principal, respectively, at the newly established Royal Grammar School located on Adelaide and Jarvis Streets, Barber found a cleared area on the property and converted it to a rustic cricket pitch. Barber was a superb organizer and a fanatic cricketer, so he immediately set out to form a cricket team from amongst the teachers, many who had come from England, and the student body. This was the first civilian team in Upper Canada. George Anthony Barber is considered the father of Canadian cricket and the founder of the Toronto Cricket Club. In a book published in 1893 George Dickson notes “ GAB was far more than just the father of Canadian cricket. He was a midwife, patron saint, lucky charm, team founder, captain, instructor, promoter – he was a one man committee of enormous vitality, inexhaustible enthusiasm, and bottomless optimism”. He was an organizer extraordinaire who delighted in imposing order upon chaos and through his determination nurtured and grew cricket and the Club throughout the early years. Barber later became the collector of fees for Upper Canada College (UCC), editor and publisher of the Toronto Herald and later held many administrative positions in government of Upper Canada. 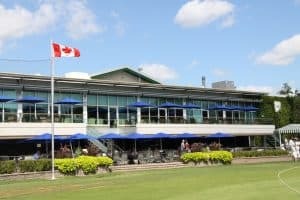 About this time another cricket ground was built on the corner of a racetrack on the Humber River, which today is Lambton Golf Club, and hosted matches between Barber’s team and local military regiments. In 1827 Barber, who taught mathematics and penmanship, set out to write a set of rules or bylaws for his Club and elected officers to run the club. He called it the York Cricket Club after the name of the existing town. In 1829 John Colborne or “Lord Seaton” Lieutenant Governor of Upper Canada established a new school – Upper Canada College – located at King and Simcoe Streets. He brought five new teachers from England to the new school, and enticed several masters, including Barber, and students from the local Royal Grammar School to join. Colbourne advocated physical development as well as academic education and consequently ardently supported cricket not only at the school but also amongst the gentry. Cricket clubs began springing up throughout York and cricket along with horse racing flourished. The York Cricket Club, which included a number of UCC students, moved to the Upper Canada College grounds and became the prominent team of its time. In 1834 the town of York, after 38 years being called York, reverted to its original name of Toronto and the Club similarly adopted the town’s new name. In 1836 UCC formed its own team and shared the ground with the Toronto Cricket Club. The annual match between UCC and Toronto Cricket Club, which commenced that year, has continued ever since and is the longest running sporting competition in North America. When Canada and the United States met for the first time at cricket in New York in 1844 the team included eight Toronto Cricket Club members. This sporting encounter known as the International Series for the K. A. Auty Trophy is the oldest international athletic contest in the world predating the America’s Cup (1851), the Ashes (1882), the Modern Olympics (1896) and various famous horse races. Cricket and horse racing were popular activities of that era and when William Boulton, a young master at UCC, inherited property at the Grange (College and McCaul Streets) in the outskirts of Toronto, he build yet another racetrack and a cricket ground. The ground was christened “The Taddle” after a nearby creek and the Toronto Cricket Club found a home until the turn of the century. During the last half of the 19th century cricket prospered in the eastern seaboard, particularly in Philadelphia, New York, Montreal and Toronto where elegant cricket clubs were built and still exist today. This was the “Golden Age” of cricket in North America. The leading cricket teams of the day played in these cities, and considerable amounts were wagered on the outcome of the matches. Gambling on cricket became so severe that the United States Congress enacted laws to curtail it and in so doing, game’s popularity in the US declined. However, cricket remained popular in Canada. In 1867 Canada’s first Prime Minister, Sir John A. MacDonald, and his cabinet, declared cricket the national sport of Canada. By this time a pitch had been laid at Rideau Hall, now the official residence of the Governor General of Canada. In the mid-1890s the growth of the Toronto towards College Street lead to the development of surrounding area and forced the Club to move across the street to the University of Toronto campus. Matches were first played on the front campus, then moved to a field that was, until recently, Varsity Stadium, and eventually to the back campus under the auspices of Trinity College. The Club became a vagabond club until in the early 1920s a group of benevolent cricketers lead by Norman Seagram came to the rescue. Norm Seagram was one of the most prominent and generous players of the time. Other members of the group included George W. Gooderham, Edward F. Seagram, Thomas W. Seagram and Robert A Laidlaw. With great foresight the group purchased from the Kendrick Land Company a parcel of land in the outskirts of Toronto near the Armour Estate at Wilson Avenue and Avenue Road for $40,880 and built a cricket pitch and clubhouse for and additional $24,495. On January 10, 1928 these gentlemen created a trust for the purpose of holding the land through Cricket Development Limited, with the trust maintaining control of its use and its eventual disposition. Five independent schools that were active in cricket were named beneficiaries of the trust. The five schools are: Upper Canada College, Trinity College School, St. Andrews College, Ridley College and Appleby College. It is through the strength of this trust that cricket is maintained and flourishes at the Toronto Cricket Club to this day. The Club struggled financially during the thirties and forties but deficits were met through the generosity of Norman Seagram and later by the sale of lots around the perimeter of the ground adjoining Saunders Street and Ridley Boulevard. Many prominent cricketers have been involved with the Club throughout its history but one in individual deserves particular recognition. Dyce Saunders was a great player and significant contributor to the operations of the Club. The north-south street just east of the Club is named in his honour. In the mid-1950s the Club continued to experience financial difficulties. The Toronto Skating Club located on Dupont Street needed more space for their famous ice shows. Each Club was a seasonal, one winter the other summer, so it made sense that they should join forces and operate as a full-year club. Informal negotiations began on the Cricket Club verandah in 1954, but it wasn’t until 1955 that the Boards of the respective Clubs began serious merger negotiations. A year later, just as the agreement was to be signed, the Toronto Curling Club’s property located on Huron Street was expropriated by the University of Toronto and joined the merger, thus becoming the third amalgamation member. The merger and building of the new facility were completed in 1957. 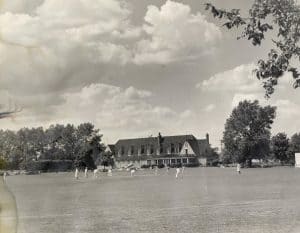 The basic principles of the new arrangement were that The Cricket Club supplied, free and clear of all claims, approximately 3.5 acres of freehold land on which the existing clubhouse, tennis courts, and swimming pool are located. The balance of the Club’s property – 9 acres of land consisting of the present cricket field, the two hard tennis courts and a 67 foot right of way through the parking lot – is leased from Cricket Development Limited on a 99-year renewable contract. 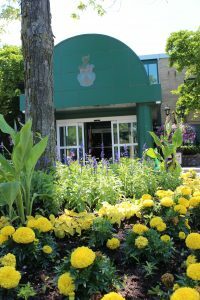 The Cricket Club, which included both tennis and lawn bowling sections, provided the property, and the two other clubs provided funding. The amalgamating parties obtained professional opinions from qualified appraisers and from these established that the value of the land was $125,000. It was an essential aspect of the arrangement with the Trustees of the original 1928 Trust that the new arrangements not deplete the assets of the Trust. It was therefore agreed that aside from other facets of amalgamation there would have to be established a sum of $125,000 payable to Cricket Development Limited, the holding company for the Trust. To avoid any possibility that the debt obligation could impose operational burden to the new Club, the Trust agreed to accept a non-interest bearing $125,000 promissory note that would not mature unless the Club ceased to carry on business. Each of the amalgamating clubs brought with it some “corporate” baggage that had to be dealt with before amalgamation could proceed. The Cricket Trust, which controls the title to the ground, was the most difficult and caused considerable problems to this process. It was through the understanding and approval of the independent schools as trust beneficiaries, that a part of the property was severed and contributed to the newly amalgamated club under a new 1956 Trust. This proved to be a major undertaking. Similarly, the Skating Club in addition to their entity of their operating club had an entity called The Winter Club that had long-standing rights and these had to be settled prior to amalgamation. The Toronto Curling Club also had a side entity, The Victoria Skating and Curling Association of Toronto Limited, which needed financial protection. This was covered by the promise that in the event of a Club wind-up, 37% of the remaining net assets of the amalgamated club would be payable to this entity. The order of the names in the new amalgamated club was decided by the cricketing tradition of tossing a coin to determine which team bats first. Robert Suckling representing cricket and Sandy McKechnie representing skating tossed the coin, with the decision going to cricket, and thus cricket precedes skating in the new name. 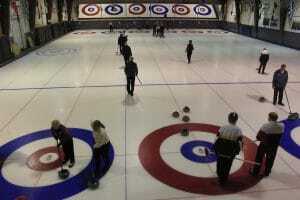 Curling joined the amalgamation later, after the toss, and is accordingly sequenced third. The building of the new club facilities ran into financial difficulties with construction cost overruns, which required compromises from all parties. The Cricket Club wanted squash courts; the skaters wanted a Zamboni, which was state of the art then; and the curlers more sheets of ice. A cricket member provided an interest-free loan, which allowed the architects to include two squash courts. Some other architectural cuts were made allowing the skaters to get the Zamboni but not the structure to house it. The Curling Club joining the amalgamation during the last year provided more capital permitting the additional sheets of ice. The property owned by Cricket Development Limited is leased to the amalgamated club on a 99 year term expiring on December 31, 2055. 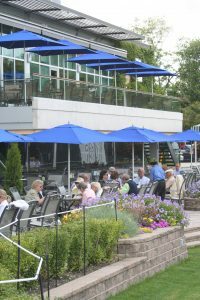 The Club pays an annual rent of $150, and is responsible for the payment of all taxes and fees, and the maintenance of the property and grounds and equipment. A prime covenant of the Trust requires that the conveyed premises must be maintained in good condition suitable for playing of cricket and other sports (curling, figure skating, squash, tennis lawn bowls, and sports approved by the Canadian Intercollegiate Athletic Union), with the added provision that cricket shall be given priority, including the requirement to offer fee concessions, if necessary, to attract cricket additional members in order to keep cricket active. The amalgamation of the three clubs has been a resounding success. Each club brought its share of history and fame and this has solidified and complemented the relationships of the Club, as we know it today. Curling gained notoriety with the development of uniform rocks; skating with its production of carnivals and a parade of Olympic and world champions and cricket as the established Canadian home to cricket and the place where major international matches have been played for over 175 years. The date of the founding of the Club was for a time contentious. Was it 1825 when Barber first formed the first civilian team? Was it 1827 when the bylaws were written and constituted? Was it 1834 when the Club adopted the new name Toronto following the change of the name of the city? Following the inaugural meeting of the Club in 1827, someone realized the importance of the organizing document placed it in safe keeping and the document did not surface until 1927 when the Club’s bylaws were rewritten. The discovery of this document provided evidence that 1927 marked the 100th anniversary of the Club. This document remained in the Club’s archives at the Wilson Avenue location. Unfortunately these archives and other records were lost in a fire that destroyed part of the clubhouse in March 1952. I would like to thank Marion Spence the archivist at Upper Canada College, Kevin Boller a cricket historian and friend and Ron Burrows, the driving force behind the amalgamation and my mentor in my early years at the Club, for their input. Edited lightly in December 2012 by John Ilkiw for posting on SAHRA website. John Ilkiw is a Director of SAHRA and a member of the TCS&CC.